Buying a forklift is a big investment. However, the cost of owning a forklift doesn’t end with the sticker price. 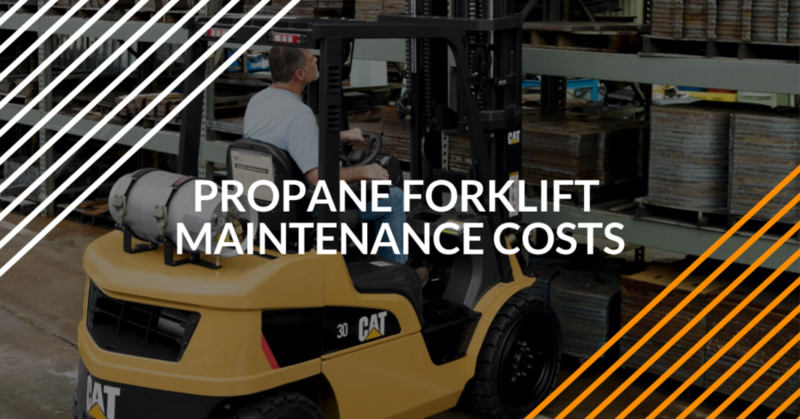 Your forklift will require maintenance costs and if you’re buying a propane forklift you will need to add the cost of fuel to your annual costs. Having a good understanding of what forklift annual maintenance is necessary and how much forklift fuel will cost will help you make the right equipment purchase for your business. Get your forklift annual maintenance plan in order, and everything else – safety, performance, workplace efficiency – falls into place. Why Purchase a Propane Forklift? Propane forklifts are popular for many reasons. When you compare the maintenance costs between an electric and propane forklift you will quickly discover that even with the price of forklift gas, the maintenance costs associated with a propane forklift are substantially lower than the maintenance costs for an electric or battery-operated forklift. Propane forklifts also give owners more flexibility. These lifts can be used in more places because they aren’t tied to a charging port or maintenance shop. Propane is also easy to get. Overall, propane forklifts are reliable and have low maintenance and fuel costs. Before buying a new forklift, you should look at the cost of forklift fuel and how much per hour it will cost you to run your forklift. You have three choices for forklift fuel: propane, diesel, and electricity. Many forklift owners think that by purchasing an electric forklift, the cost of fuel is eliminated. However, electricity demand for a forklift can be high and should be considered in your expected ongoing maintenance costs. Because propane is a more efficient source of energy, it is a cost-effective forklift fuel. Propane forklifts have lower per hour fuel costs in general over the typical electric forklift. As electric rates increase, and the availability of propane becomes greater, the cost of propane may continue to decrease, making it an ideal forklift fuel. The ease and low cost of maintenance are the greatest advantages of owning a propane forklift. However, it’s important to understand the limitations that a propane forklift may have. First, propane for forklift fuel can become unreliable or cause starting problems if you are using the forklift in below freezing temperatures. Propane forklifts must also be used with caution indoors. Warehouses and factories must have good ventilation if using propane for their forklift gas. Propane is a cleaner forklift fuel than diesel, but it does create some emission gases. Just like other forklifts, there are ongoing long-term maintenance costs. When purchasing a new propane forklift, you should carefully consider the overall costs associated with maintaining and operating a forklift. Beside the forklift gas, all propane forklifts will require new tires, batteries, and general maintenance. When comparing propane forklifts, you will want to look at the types and availability of basic parts. If you do not have a maintenance department, you will also have to consider the cost of having your propane forklift serviced by an outside firm. Many equipment dealers will provide this service. Just make sure that you ask the dealer about the cost of having your new propane forklift serviced. While propane forklifts operate a bit differently than other lifts “under the hood,” they’re still powered industrial trucks. As such, they have similar maintenance requirements as other forklifts. Smart forklift annual maintenance actually starts with scheduled daily, weekly and monthly checks. – Ensure forks are aligned. This helps to prevent tip-overs and also improves performance! – Conduct routine inspections. This includes both visual and operational inspections. Any squeaks, shrill noises, and other potential problems should be addressed immediately. If not, small noises (or other issues) will become big problems down the road (or aisle). – Check tire pressure. Propane forklifts aren’t immune from underinflated tires. The best forklift annual maintenance includes tire pressure checks on a daily or weekly basis. For more helpful forklift maintenance tips (weekly, monthly and annual), check out our blog post on this subject. Not all forklifts are the same, and not all forklifts are useful for all applications. When doing your research, you should look at all types of forklifts, not just propane forklifts. There are great resources available to help you compare and select the right type of forklift for your business. Articles like this one provide helpful information on the wide range of forklift options that can be useful for your business. When making a big investment in your business, buying the right equipment for the job will make the investment, though substantial, worth the money. Besides the forklift fuel type, make sure that you consider lift type, load weight, turning radius and maintenance requirements. Once you’ve made your choice and settled on an effective forklift annual maintenance plan, contact ForkliftCertification.com for all of your training needs. Our OSHA compliant certification and training programs show anyone how to safely operate any forklift. Don’t wait another day to get your workplace compliant – sign up with ForkliftCertification.com today!